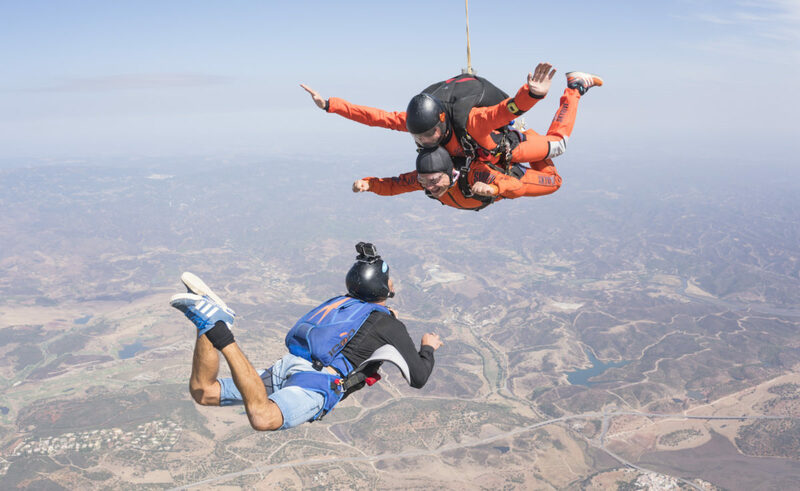 Tandem Skydiving in portugal is Skydive Algarve! 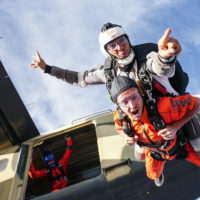 Skydive Algarve is located in Alvor, Portugal. We are where you skydive in paradise. 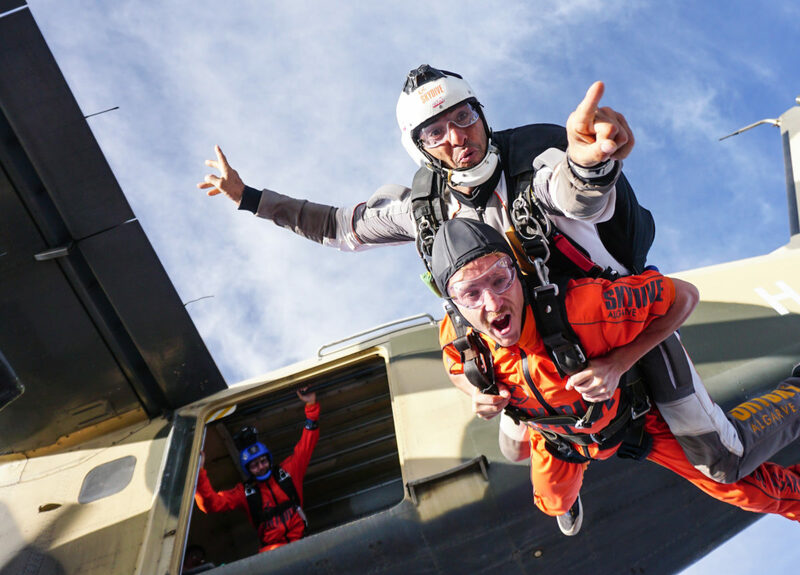 A tandem jump is our most popular and the ideal way to try skydiving for the first time without any experience needed at all. 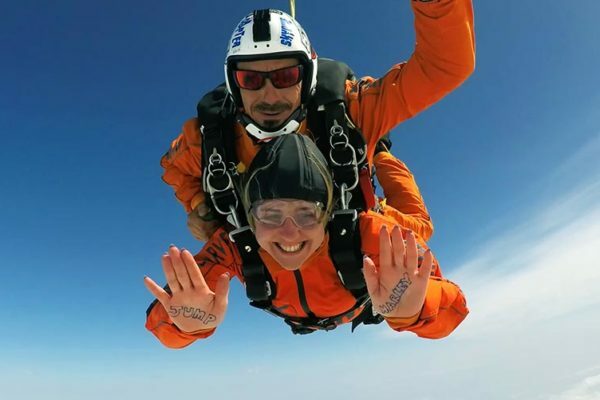 All our expert tandem instructors all have thousands of skydives and you will jump using a large parachute specifically designed for two people. 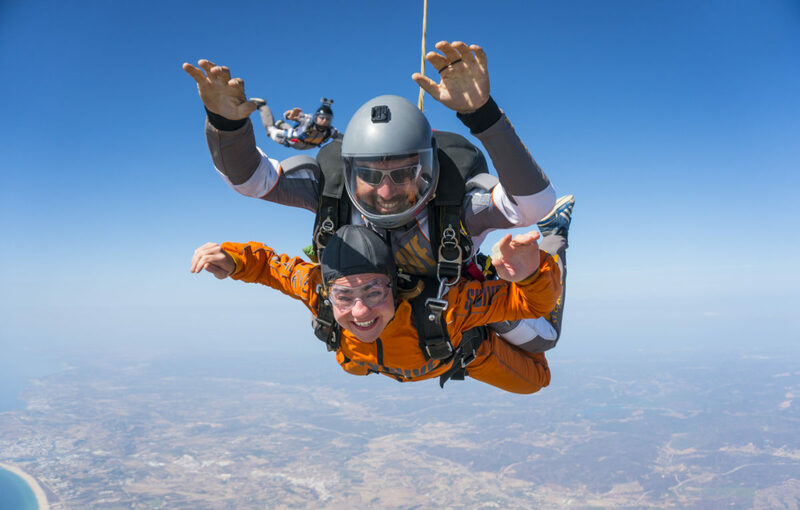 Securely harnessed to your qualified tandem skydiving instructor you will experience the thrill and excitement of freefall and enjoy the breath-taking sea views over the coastline of Portugal. 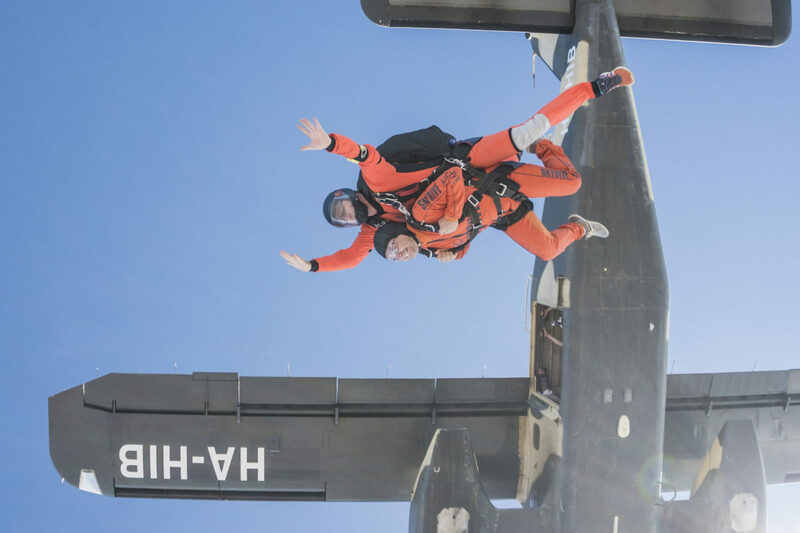 There’s a short ride in our specialist parachuting aircraft before you take an exhilarating leap from 15,000ft (4600m) reaching terminal velocity at around 120mph! Your instructor will then open the tandem parachute after 60 seconds of free-falling and fly you safely back to earth. We offer an optional outside video and photo package (or alternatively the handycam option which is a camera used on the wrist of your tandem instructor) so you can take the memory of the most exhilarating experience of your life home to show your friends and family. 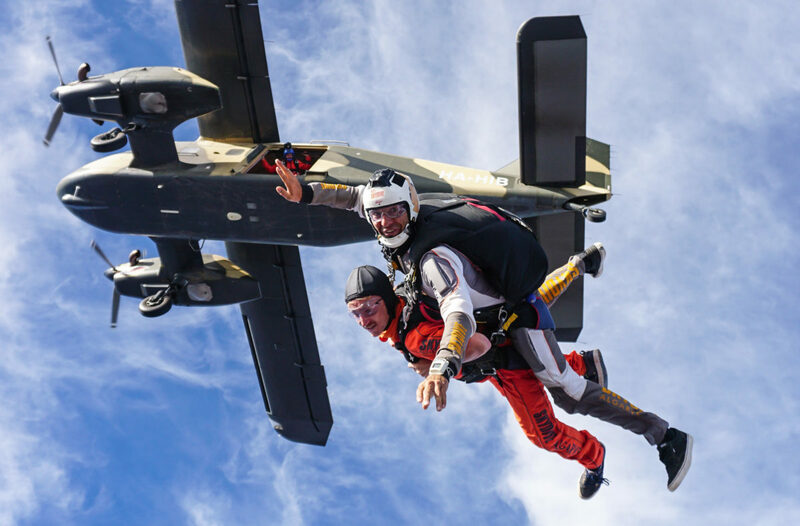 Relive your skydiving experience again with friends and family and post your photos on Facebook for everyone to see. We have three options: Your very own skydive cameraman, a handycam or for the ultimate package we have the combo- external camerman plus handycam!. 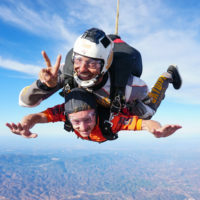 A professional skydiving videographer will capture the whole adventure jumping out with you and your instructor in freefall. Your skydive footage will be edited with music and title screens, and you will also receive a full set of high-quality digital photos. Make sure you pre-book to guarantee a cameraman is available for your jump. You may be able to arrange it on the day subject to availability. We also offer the handycam option, where instead of having an external videographer, your tandem instructor will take the go-pro on his wrist. In this package you will receive the 30-40 photos and the edited video footage. OR if you wish to have the very best coverage of your skydive we would suggest you go for the combo package where you get to have your very own external camera flyer PLUS the handycam on the wrist of your instructor giving you the ultimate video and photo package. AND WITH AN EXTERNAL VIDEOGRAPHER YOU’LL RECEIVE FOOTAGE LIKE THIS. Choose Your Tandem Skydiving Adventure! Those who have medical conditions (any age), recent/recurring injuries or are currently taking medication. If you have any doubt, download the form, read the information and take to your doctor. Bring comfortable clothing and trainers – we’ll provide the rest! Are you ready to live an unforgettable experience? 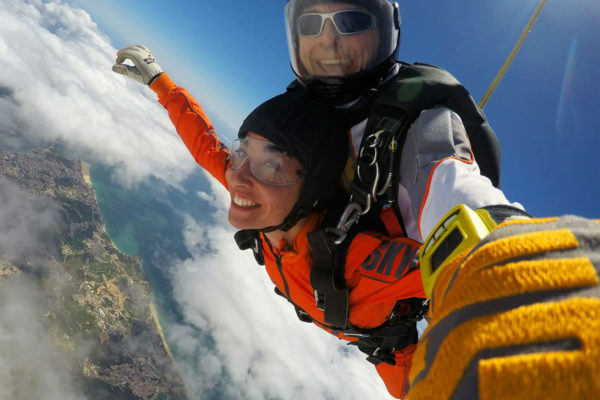 Book your tandem skydive in the beautiful coastline of Algarve? Book now! *Those aged 16/17 travelling without a parent present will require notarised consent from both parents if applicable. Meet your cameraman for a short interview – make sure you have booked your video and photo package! Enjoy the 15-minute ride up to 15,000ft (4600m) in our fast parachuting aircraft. At 6000ft the parachute will be opened by your instructor and you can take in the stunning sea views whilst under canopy for around five minutes. Land back at the dropzone with a huge smile on your face! 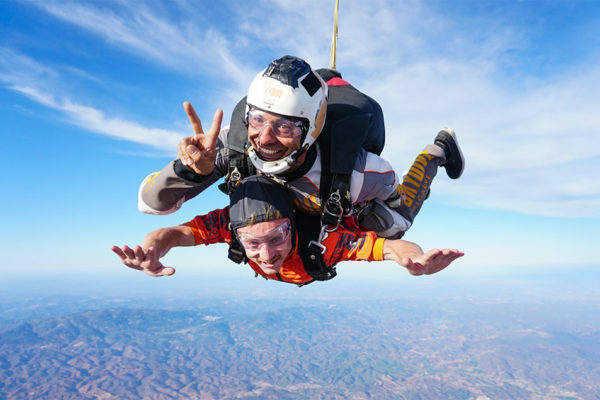 View our full list of tandem skydiving prices, group discounts and special rates! 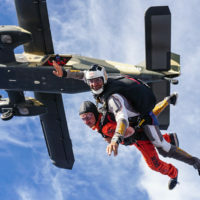 Have questions about tandem skydiving? We've got answers! Read our FAQs. Ready to go? Click here to begin your adventure!